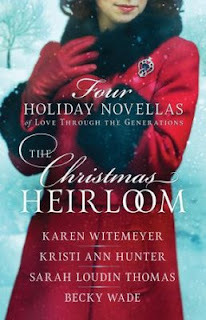 An heirloom brooch connects four generations of Christmas romance! In Legacy of Love, Sarah returns a lost pin. In Gift of the Heart,Ruth uses it for collateral. In A Shot at Love, a hunter captures Fleeta's heart using the ornament. And in Because of You, Maddie rediscovers the antique. Will it bring her love? Buy the book HERE. Legacy of Love, by Kristi Ann Hunter - Sarah Gooding never suspected returning a brooch to an elderly woman would lead to a job . . . and introduce her to the woman's grandson, a man far above her station. Gift of the Heart by Karen Witemeyer - Widow Ruth Albright uses the family brooch as collateral for a loan from the local banker. But the more she comes to know the man behind the stern businessman, the more she hopes for a second chance at love. A Shot at Love, by Sarah Loudin Thomas - Fleeta Brady's rough-and-tumble childhood means she prefers hunting to more feminine activities. She never expected her family's brooch might be how a fellow hunter turns her attention from competition to romance. Because of You, by Becky Wade - Maddie Winslow has spent years in love with a man whose heart was already spoken for. When a church Christmas project brings them together and she stumbles upon an old family brooch, might it finally be her turn for love?